Baby Becerra #2 is growing very well. We had another doctor appointment this afternoon and these are the latest snapshots. 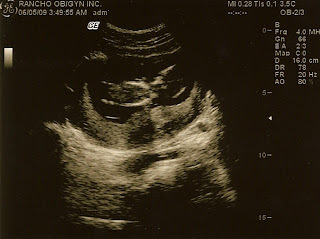 The heart monitor wouldn't work through the belly just yet, so we got another ultrasound with some pictures! 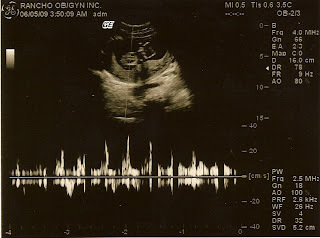 It is very possible that we couldn't hear baby's heart beat because of the movement! This baby can easily be described as a "Mexican jumping bean" to say the least. In the short seconds we saw him/her on the screen, there were hands flying through the air, jumping up and down, and general movement in all directions! We certainly do have another wild child on our hands! :) When Jaycee's ultrasounds were being conducted, the technician always thought she was a boy and called her a "boxer" because of the way she flailed her arms all over the place. This baby appears to be exactly the same! Coincidence? We shall see in a short time. 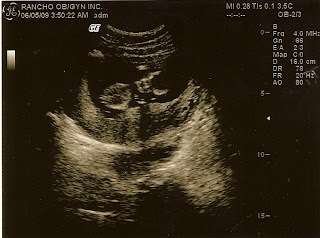 This picture shows baby's hand way up high, baby's head on the right, body on the left. 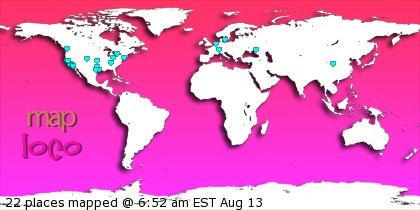 A pretty clear picture considering we didn't think we were going to get any! :) Who doesn't want extra pics?